If you follow my reviews at all you’ll probably know that I think Seanan McGuire/Mira Grant is one of the best writers of urban fantasy currently writing/publishing. Her newer ‘Wayward Children’ series is a slight departure from the urban fantasy setting of her popular October Daye series but it is equally impressive and powerful. The book/series is a dark look at the Jack and Jill fairy tale. Jack and Jill are twin sisters (Jacqueline and Jill) and the story is of their childhood (such as it was) up to the point where we see them in the previous book (Every Heart a Doorway) (meaning, of course, that this is a prequel). Jack is the girly-girl. She was her mother’s project to dress up in frill and lace, whereas Jill is the tomboy – the son her father wished for and tried to raise. Like many siblings, they don’t always get along, but when they discover a doorway to a strange, magical land, they will need each other (and each others’ strengths) much more than they might expect. Seanan McGuire not only writes lyrical prose that is haunting and beautiful and really holds a reader, but stories such as this reach further into social themes than one might ordinarily expect with an urban fantasy. Parenthood, gender identification, parent/child expectations are a few of the themes explored in this fairy tale and in McGuire’s hands we can be sure that answers to questions won’t be easily forthcoming (if at all). The only downside to this book is that if you’ve read Every Heart a Doorway you will know how this ends. As such, for those just beginning to discover the magical words and worlds of Seanan McGuire, it might have been nice if the publisher listed this as book #.5 instead of book #2. But that’s a pretty minor complaint. Read the books in whatever order you want, but do read them. Looking for a good book? 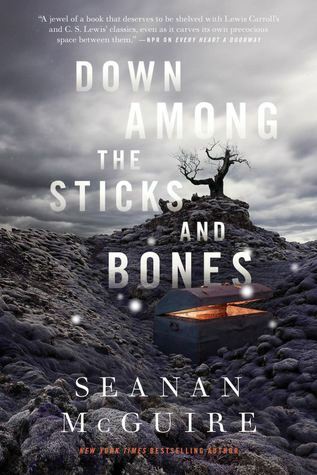 Down Among the Sticks and Bones is a short book by Seanan McGuire … short in terms of page numbers, but full-bodied in terms of theme and story. It is a must-read for lovers of fantasy fiction.